Horses are incredible creatures... beautiful whether they are standing still or moving. 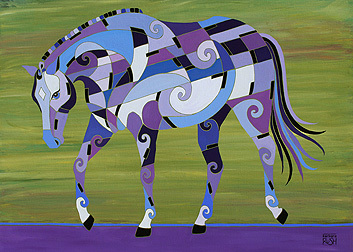 In the Tao of Harmony I have added some black piano keys and swirls to add to the musical quality of the movement of the horse. The horse is relaxed as it moves forward walking peacefully toward it's destination yet a symphony of movement is still going on beneath the surface. ©2007-15 Barbara Rush. All rights reserved. Site designed and maintained by br3 studios.